Smoking methamphetamine is the most frequent route of administration but it may be taken orally, by injection, or intranasal ("snorted"). If smoked or injected, the user experiences an intense sensation called a rush. This may last only a few minutes, but is described by the user as extremely pleasurable. If meth is snorted or taken orally, the user experiences a euphoria, but not an intense "high." Snorting produces effects within 3 to 5 minutes and oral ingestion produces effects within 15 to 20 minutes. As with other drugs, users may begin with casual use, but soon begin to develop a tolerance. In order to get the same effect experienced by the initial use, they increase the amount or change routes. For example, if taken orally initially, the user may change to either smoking or injecting the drug. "While meth is still predominantly smoked or snorted, police and public health workers in Anchorage also say that the ubiquity of intravenous opioid use has opened the door to more people shooting meth with needles, though nobody can provide firm data. The theory goes that prescription opioids and heroin may have helped people get acquainted with intravenous use, making it more palatable for those hunting for more intense highs. “Slamming,” as injecting speed is called, is the most dangerous ingestion method. Not only does this raise the risk of overdose, but also transmission of HIV and Hepatitis C", (Hughes. 2018). 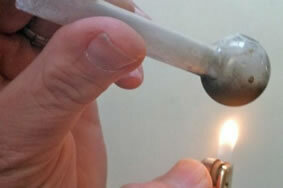 Methamphetamine may be taken PO, IV, smoked and snorted (intranasal).